This one goes with everything! 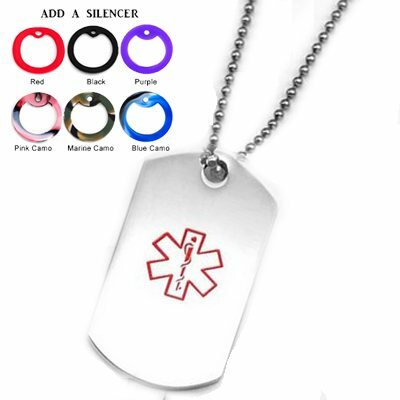 A 316L, non-corosive, waterproof stainless steel Medical Alert Dog tag with "RED" Medical Alert symbol. May be engraved on front and back with your personal medical information & includes stainless chain (not 316L) with coupling closure. This laser engraved item not available for further discounts. Engraving is done in CAPITAL LETTERS. Please leave spaces for clarity.